This page will provide you with information about having a carpal tunnel release procedure. For further details, please speak to your consultant. The median nerve in your wrist is located in a tight tunnel (carpal tunnel), along with the tendons that allow your fingers to bend. When there is increased pressure on this nerve, the condition is known as carpal tunnel syndrome. Surgery relieves the numbness and pain that can be felt in your hand as a result of this condition. Mild symptoms can often be alleviated by wearing a wrist support at night. Numbness and pain can be reduced by a steroid injection close to the carpal tunnel. What will happen during the operation? The operation usually takes about twenty minutes and is often performed under local anaesthetic. 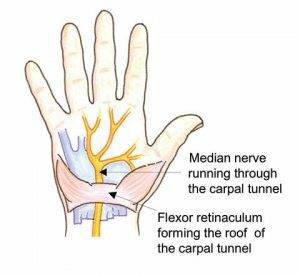 Your surgeon will cut the tight ligament – known as the flexor retinaculum – that forms the roof of the carpal tunnel via a small cut in the palm of your hand. Most people are able to go home the same day as the procedure. It is advisable to keep your hand bandaged and raised for the first two days of recovery. To prevent stiffness, it is important to exercise your fingers, elbow and shoulders gently; exercising regularly should also help you resume normal activities more quickly. Always consult your GP or healthcare professional for advice before you start exercising. You may find your symptoms continue to improve for up to six months after the procedure. If you are experiencing numbness in your thumb, index and middle fingers, a carpal tunnel release should alleviate your symptoms. It could also prevent permanent damage to the nerve. EIDO Healthcare Limited – The operation and treatment information on this website is produced using information from EIDO Healthcare Ltd and is licensed by Aspen Healthcare. The information should not replace advice that your relevant health professional would give you. Price for this procedure from £1650. Call us on 020 8971 8008 for our self-pay prices.